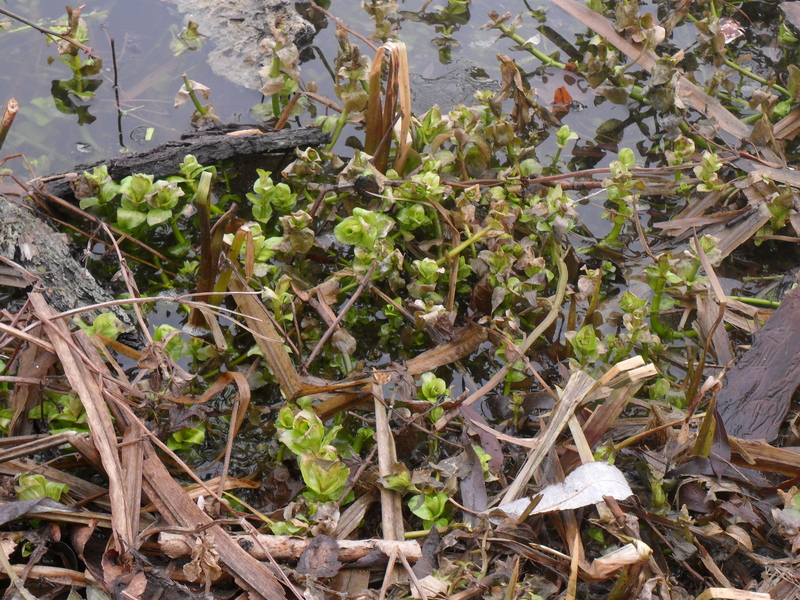 Water-mint, Teufelsee, early March – in many places the immediate water’s edge was too deeply frozen to allow harvesting. A great example of the value of using different senses in identifying plants – the cool, earthy menthol scent is unmistakable. This is also the only mint growing in a fully-submerged environment. In my opinion it is more suited to use fresh than it is useful dried. Stems are rounded, leaves clasp the stem tightly and give a whorl-like effect when viewed from above. Flowers are purple and in form are typical of other mints. Earliest growth shoots can have a reddish hue. Not related to the greater celandine (Chelidonium majus), lesser celandine’s new growth is abundant at a similar time, and is one of the first yellow flowers of spring, traits it shares with greater celandine. The small, cordate (heart-shaped) leaves are lush green, the stems attached on the underside at the heart’s crest. Grows in clumps and bears yellow flowers. Many plants produce bulbils (swollen roots), which are a reliable (though not decisive) method of identification – just carefully grub up a single stem, taking care not to disturb the soil too much. The bulbils have a rubbery feel to them. Though a bit on the small side, the plant very often grows in massive drifts, meaning that a little invested time amounts to a worthwhile harvest. 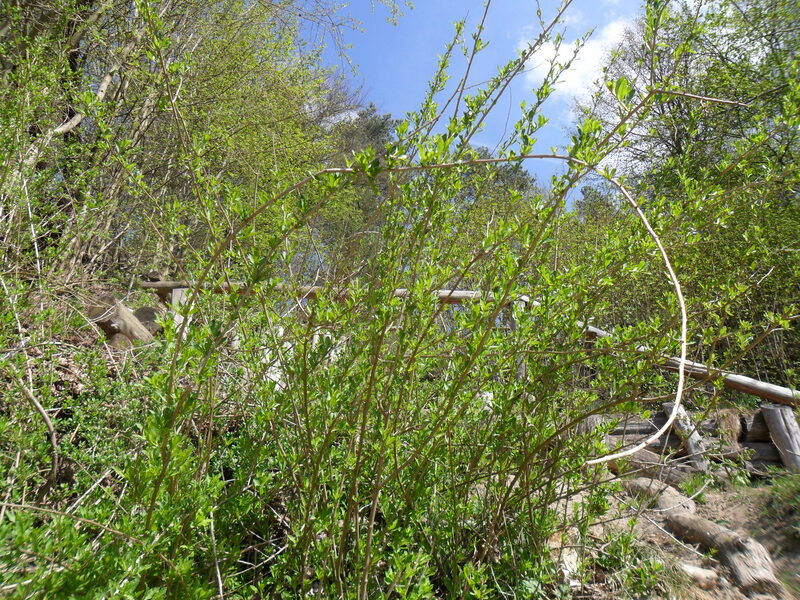 Its German name Scharbockskraut (a permutation of Skorbutskraut) translates to something like ‘scurvywort’ in English; the young leaves contain lots of vitamin C, and this name confirms its worth for seafaring folk as an antiscorbutic in former times. The beautiful and tiny fruiting bodies of Xylaria hypoxylon, photographed in late autumn in the woods surrounding Buckow, in Märkisch-Oderland. Its incredibly apt common name is evidence of the rich poetic heritage of the common botanical nomenclature. Xylaria hypoxylon: I will most likely never, ever learn to memorize your Latin moniker off-pat. A cheery sight on a cold autumn walk; don’t eat it (though it won’t hurt you), don’t harvest it (though it looks pretty), don’t disturb it. The winter aconite or, as it is sometimes also confusingly named, wolfsbane, is a good example of a poisonous plant closely-related to and growing at a similar time and place as an edible plant. 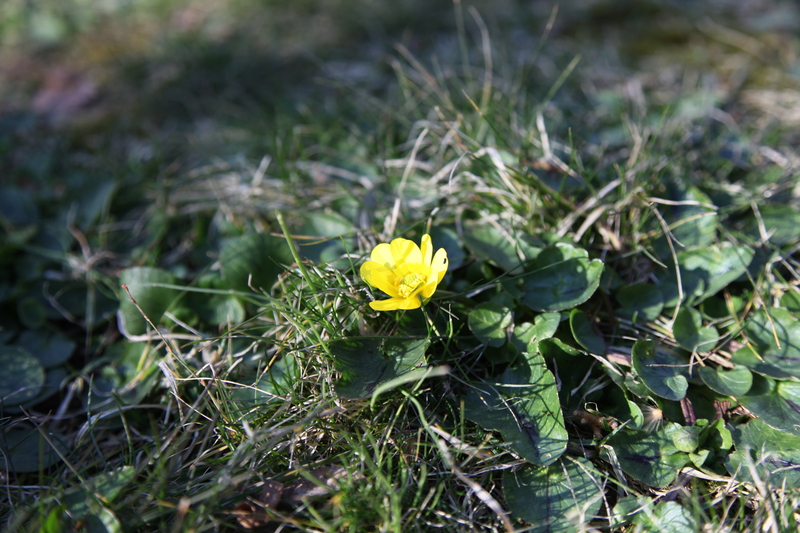 Being a buttercup, its flowers somewhat superficially resemble those of the edible lesser celandine (see above), and both are found at roughly the same time of year (early spring), and in similar conditions (shady woodland). The major difference is in the leaves – the ragged, fan-shaped leaves of poisonous winter aconite appear after flowering, whereas the heart-shaped ones of lesser celandine are first to appear. Lesser celandine’s flowers also lack the frilly bract clearly visible in the photo of winter aconite. 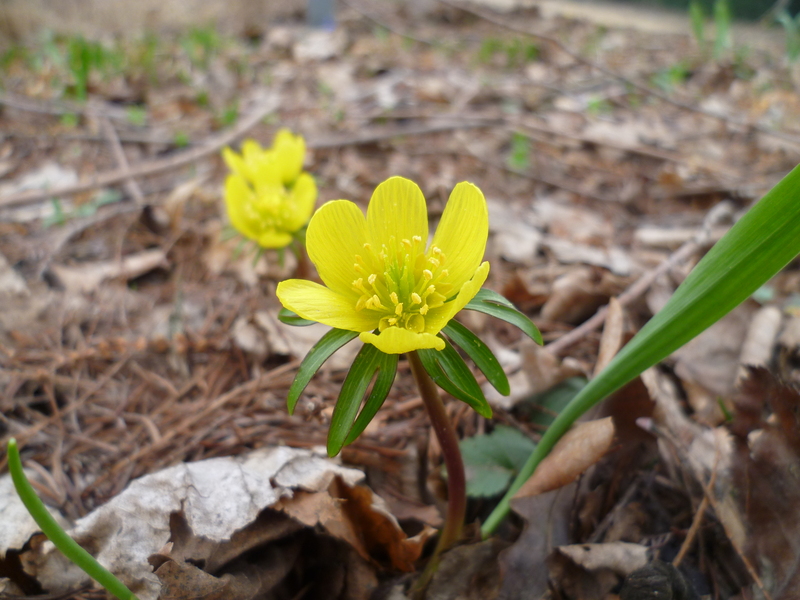 Luckily, the winter aconite is extremely unpalatable, so risk from its posionous cardiac glycosides is fairly low, but the superficial similarity indicates the possible dangers of a false identification for luckless herbivores. Found on the bare rocks of the Black Sea coast, Rumeli Feneri, near Istanbul, late February. Glaucus, straggly, rose-tinged in places, this sea purslane is the one familiar to people living on the British coast, though only familiar to me through books until last week. It grows close to the water’s edge and is probably submerged during the higher tides. Succulent, aromatic and tasting instantly of the sea air, it is a strange herb to work with, ‘naturally salty’ being a bit of a rarity as far as attributes go. As is evident from the photo, when looking for sea purslane don’t think winter purslane (Claytonia perfoliata) of garden salads – the plant is woody, prostrate, with leaves resembling those of a dwarf olive. Though closer resembling the european holly (Ilex aquifolium), I like to think of butcher’s broom (Ruscus aculeatus) as a heavily-armed asparagus, as it reminds me that the two latter plants are indeed related. Quite unmissable for its stiff spiny growth habit, butcher’s broom has hastate (spear-shaped) leaves that clasp the stem, and are incredibly rigid and sharp. Its flowers are a greenish colour and can be seen in spring. The fruit are yellowish when immature but ripen to a deep red and can remain on the bush into winter. According to PFAF (Plants For a Future) the seed can be roast and ground to be used as a coffee substitute. 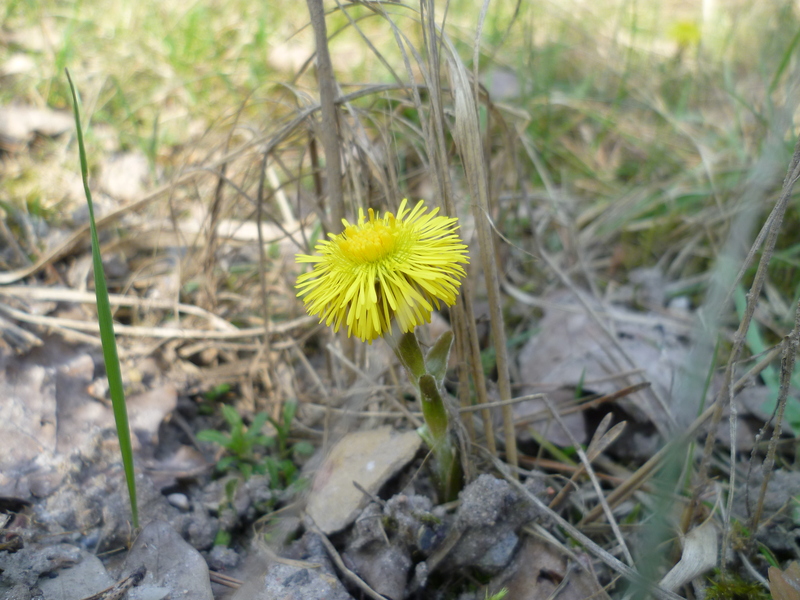 The small, sun-hungry flowers of coltsfoot stand out in the undergrowth for their habit of appearing before the actual leaves of the plant, from whose hoof shape it gets its English name. The Latin name reveals the established medicinal usage of coltsfoot in antiquity, tussis being a persistent cough, and agere the verb ‘to diminish’ or ‘to dispel’. The flower-heads and possibly the scaly stems were smoked to soothe asthma and lung complaints, and the flower-heads are still sometimes added to honey to make a cough-syrup. The presence of pyrrolizidine alkaloids – as with borage and ragwort – is a concern, due to their purported liver-damaging capabilities in sustained doses and for pregnant women. Even clinical studies of the relative level of pyrrolizidine alkaloids in given plants and its toxicity yield contradictory results. Growing in damp areas, the leaves begin to show as the seeds of the plant are already set, fraying from the composite flower-head in air-borne billows when disturbed. 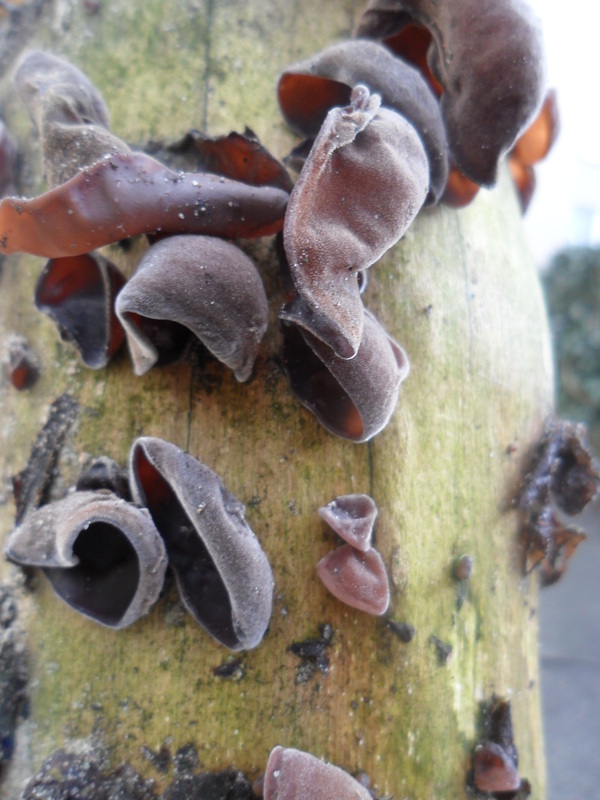 The scalloped earlets of Auricularia auricula-judae, growing as so often on dead elder. The fungus establishes itself very readily on elder deadwood, and is rarely found on other trees, indicating the specificity with which many fungi are matched to their host. Also known as Jew’s ear fungus (probably a confusion of the Latin genitive for Judas, Judae and the proper noun Judea), it is often seen apologetically listed as ‘jelly ear fungus’ – this is to be avoided, as in striking a blow for political correctness it removes all trace of the true common name’s meaning: strangely, the boughs of the elder were the chosen tree from which Judas Escariot is said to have hanged himself. An easily recognizable edible fungus that can be found at almost all times of the year, though is often shriveled and seemingly unappetizing in the depths of winter. Its colours and texture range greatly with the seasons and perhaps with humidity; moist it is at its most ear flesh-like, at other times it has a purplish tint and furze; it is almost black during the frozen months. 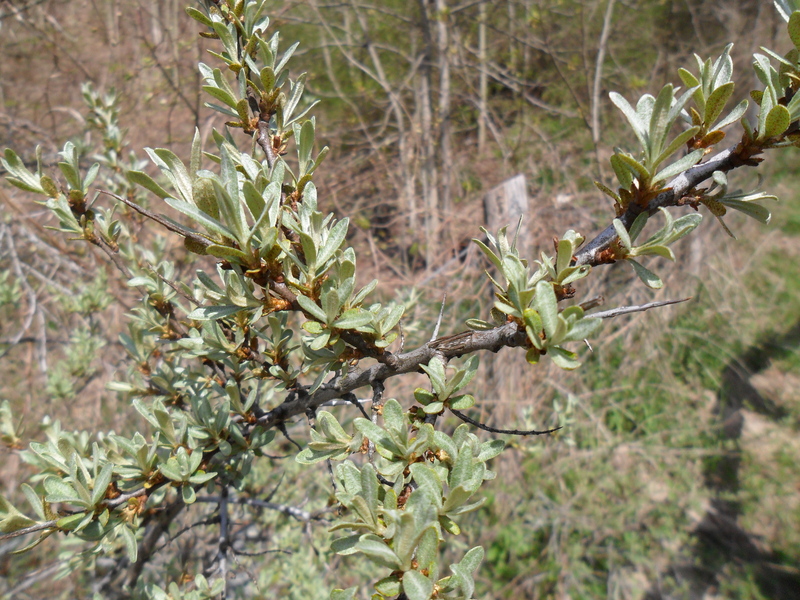 The cornelian cherry or cornel is a good example of how informative seasonal plant identification can be. 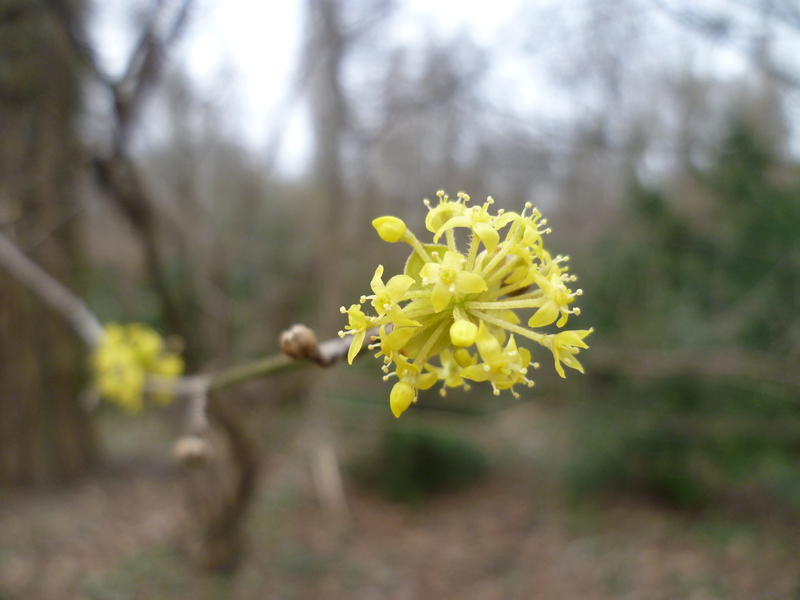 Though readily blending with other shrubs most of the year, the flowering cornelian cherry can be seen at great distances during spring, with its loose spray of yellow clusters forming well before the leaves (very early in some regions). For this reason, it is often planted in parks and gardens to add colour in the bare months. From a foraging perspective, the sight of flowering cornel means marking the place for a future harvest – in late summer when the fruits are almost over-ripe, they can be harvested to make a number of fruit preserves – in Hungary cornelian cherry jam, or söm (pronounced ‘shem’) is still regularly made come harvesting season. 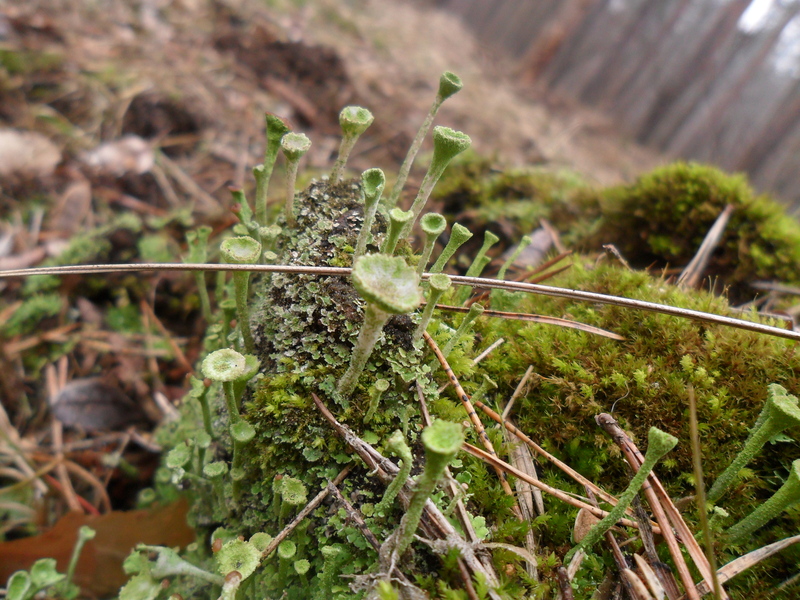 The trumpet-like protuberances of a cup lichen. What exact species of Cladonia this one belongs to, I have no idea. Being introduced into fungi opens up a third dimension to what was previously a two-dimensional flora/fauna perception of living things, and although lichens belong to the former group, they take a keener eye and a much greater level of experience to recognize and understand. These I found growing on a rotting log just near the abandoned radar station at the foot of the Teufelsberg, Berlin. 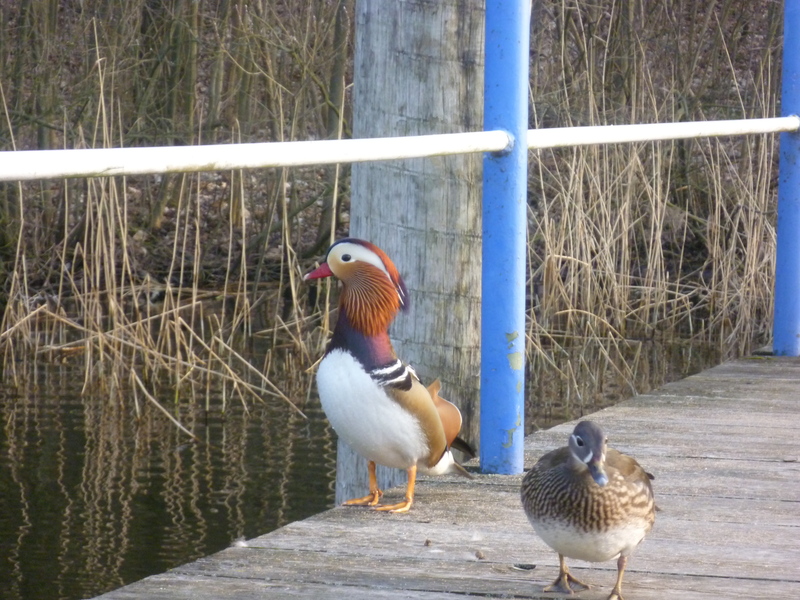 Mandarin ducks on the pontoon of the Pfaueninsel (Peacock Island). Berlin Brandenburg hosts the largest feral population of this species in Europe, having escaped captivity to establish itself in the wild. The male is incredibly striking in colour and pattern, with its fiery neck, barred back, white breast and blood-red beak. The female, though quite small, was on this occasion remarkably territorial, chasing both the male and female of a mallard pair from the pontoon, having hopped up alone to investigate the chances of food on solid ground. St Patrick’s Day, 2012. 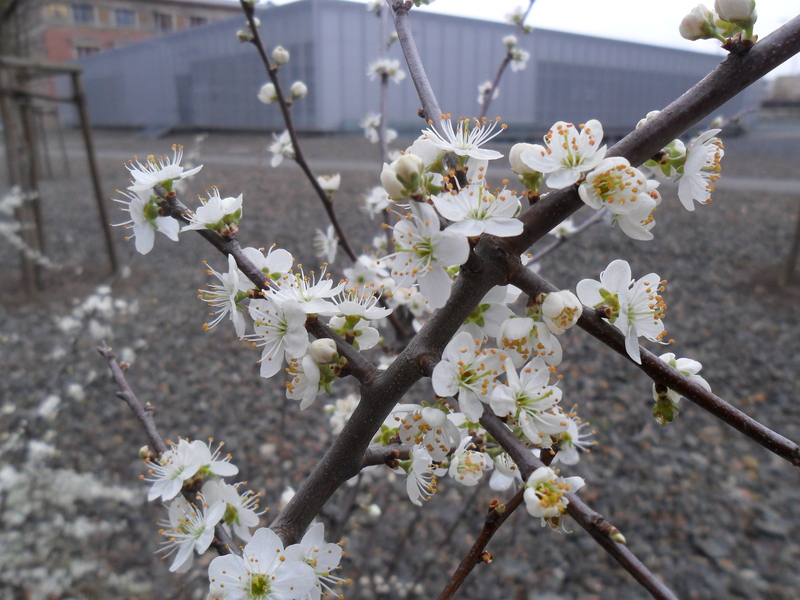 The blossoms of the blackthorn, late March. Being from the Prunus genus, the blossoming trees can at a distance resemble other spring-flowering species. 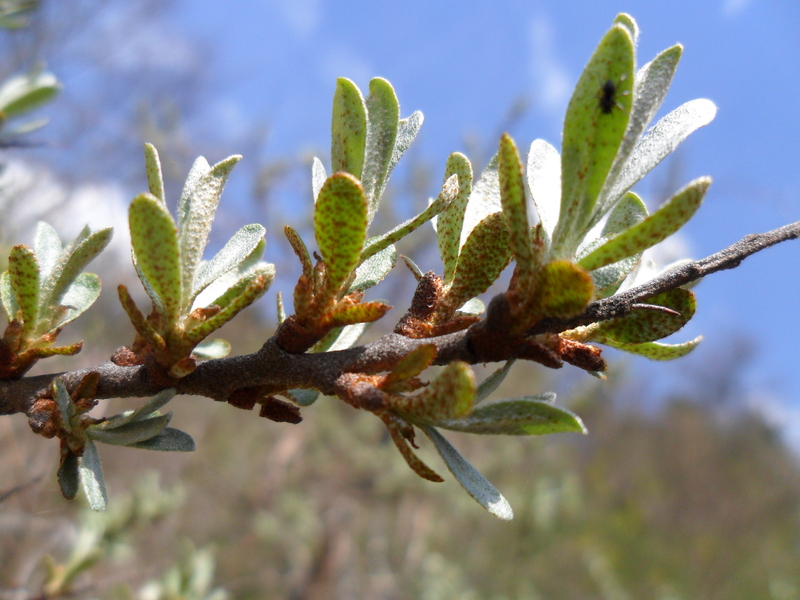 Up close, the bushes prove to be bristling with sharp spines, and very often the sloes can be found dried and clinging tightly to the branches, which should clarify identification. The blossoms are a relatively early source of nectar for the bees, and so shouldn’t be taken in large quantities, but the odd one or two nibbled on the fly is a spring treat – they have a sweet, slightly soapy tang reminiscent of marzipan, testament to the cyanogenic trace compounds in the plant. A long time after flowering, here in late autumn, comes the sloe harvest (see blog), the fruit staying on the branches well into the late winter. Though flowering a little later than the latter, the blackthorn could easily be mistaken for the cherry plum (Prunus cerasifera), which is no great tragedy if you’re in time for the cherry plum season, which is generally late summer. 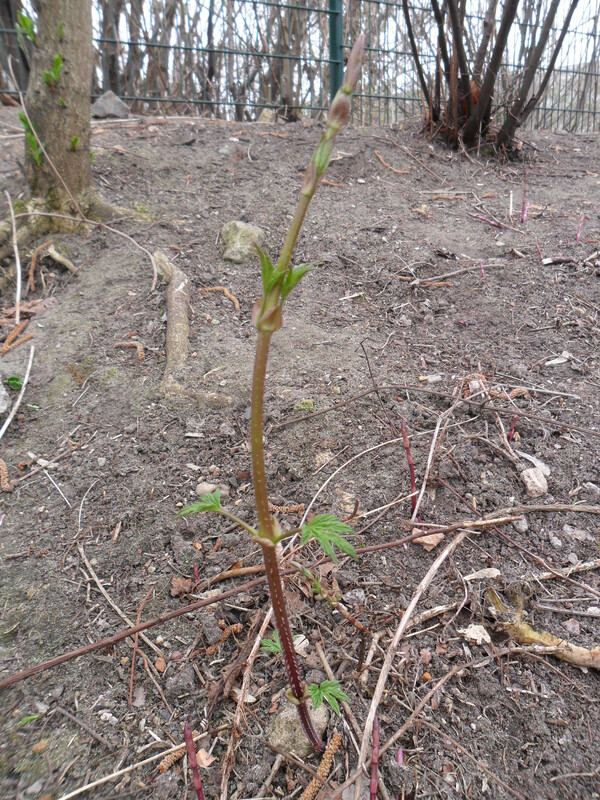 Early, edible shoots of the hop, in spring. Look for the conspicuous cannabis-like leaves – the common hop is also form the cannabis family. The shoots vary in colour from lime green to crimson, some being a mixture of the two. The succulent tops of the hops can be cut back (best to just above the leaf node), peeled and used as an alternative to asparagus. In Belgium, especially Flanders, the shoots, or hopscheuten, are grown and sold commercially for the gourmet market, fetching sometimes €1000 per kilo for the earliest harvest (they are seemingly grubbed up in winter – all explanatory information I can find is in Dutch). The roots are also edible, though unless you are finding cultivated hops in an old hop yard (look for remains of training wires and frames, and orderly rows of plants), they will most likely be too stringy and fiddly to be worth the effort. The shoots can also be peeled, chopped into lengths and pickled. Though hops are very vigorous and withstand a good bit of cutting back, the shoots toughen with age, so only take the very first few inches. The Duke of Argyll’s tea plant or wolfberry is known for its fruit, sold on the health food market as the Tibetan goji berry. It grows however wild in the UK and mainland Europe, though it seems to me (at least for the beginning of the year) a bit of a recluse out in the open. Coming across it for the first time in the wild, before its characteristic purple flowers or pendulous fruits are to be seen, there are few things to help you pick it out of a hedgerow. No doubt everyone learns his or her unique way of recognizing any plant, but for me, Duke of Argyll’s tea plant is all about these arching, almost bramble-like (in growth habit, not in form) stems, which are both rigid and flexible, giving the appearance of a much larger surface area. Its leaves grow in whorls on a woody ashen stem, the nodes alternating or circling the stem. On an average branch, the leaf clusters are regularly two or three centimetres apart, and the leaves are linear. For me these traits come much later in pinning the plant down; the sprawling and over-arching stems are strangely the primary means of identification (hence the photo). The spring-flowering fumewort (Corydalis solida) is rarely given its common name. Its German folk title translates to ‘the palmate larkspur’. It is a fumitory (member of the Fumariaceae), often growing as an introduced species, common in woodland, and can be seen only in early spring. Its membership in the Order Ranunculales is instantly identifiable when you consider the likeness of its superficial aspect to that of the true aconite or monkshood (Aconitum napellus). The meaning of the common name fumitory has quite literally vanished in smoke – the medicinal worth of fumaric acid is questionable (it is used as an acidity regulator in the food industry, and has the E number E297), and in no stage of their growth do fumitories have any vaporous, smoke-like qualities about them (unlike for example the flowering smoke bush Cotinus coggygria). There is one variety of pale fumitory, Fumaria vaillantii, whose flowers it could – with a bit of artistic license – be said to resemble smoke at a distance. Much more likely would be a permutation of the common name, though in this case the Latin, English, German and French names all silently agree on the smoky epithet. 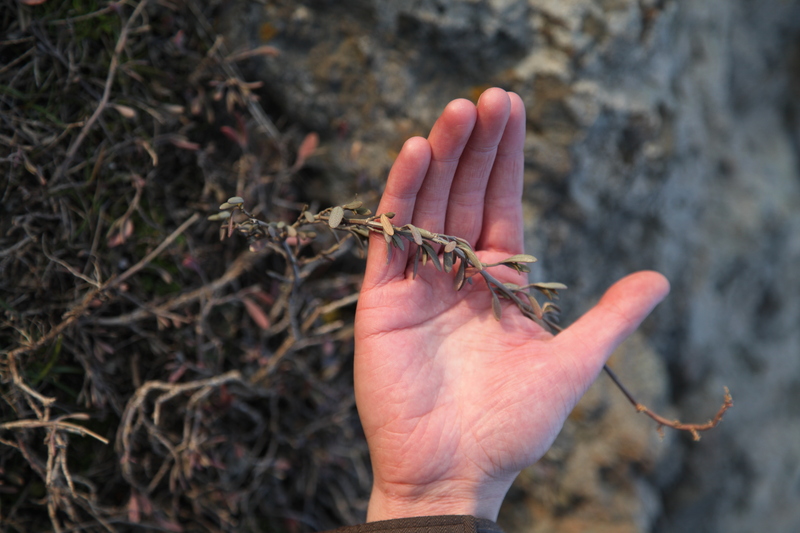 Without ethno-botanical evidence of charred seeds, it is also difficult to hypothesize the etymology of fumitory as a reference to burning of the plant as part of a ritual or ceremony, regardless of the truism that ubi fumus ibi ignis. A tiny, early dog violet growing among herb robert (Geranium robertianum) and sweet woodruff (Galium odoratum). 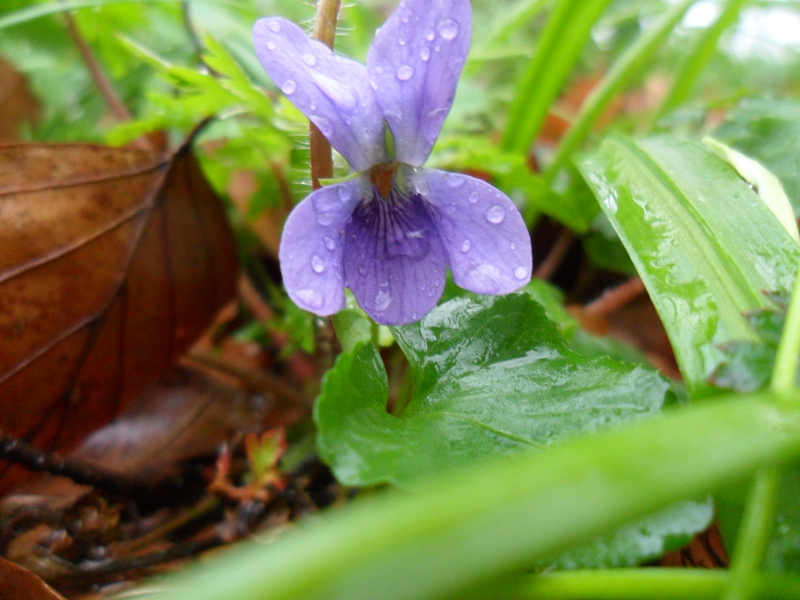 It is a true sign of coming spring here on the continent, appearing before other violets. It is a fun challenge for the amateur to distinguish it from its close relative species (V. riviniana, V. canina, V. odorata etc), but patience rewards the effort. 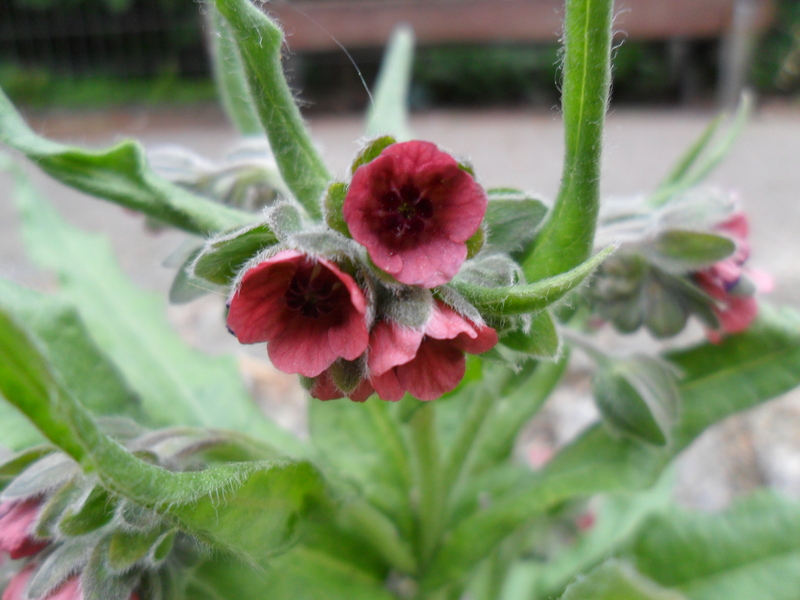 The flower spur is the same colour as the main petals, namely light violet, unlike V. riviniana and V. canina. The sweet violet (V. odorata) bears a sheath-like leaf scale half way up the flower stem, and in flower it is flatter and appears more flounced or frilled than other species, also having more prominent veins, and is stoloniferous in growth habit, creeping on stems which spread similar to strawberries. The scent of sweet violet is apparently an unreliable source of identification, many people being insensitive to its smell, and many areas having sweet violets that appear to be scentless even to those who are sensitive otherwise. 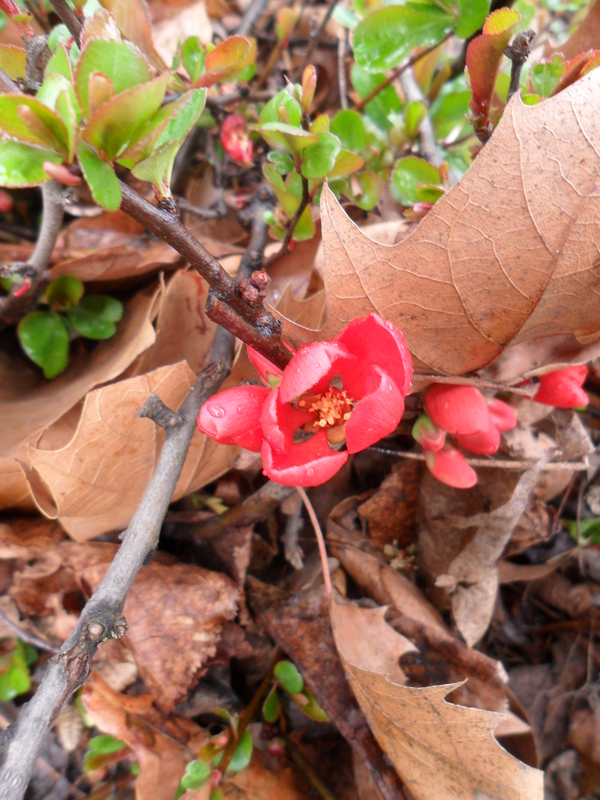 Japanese quince is often used in landscape gardening to make parterre-like hedging, and though only related to the cultivated quince (Cydonia sp. ), it is a staple of urban environments, often lining pathways in tightly-planted shrubberies. The flowers are spectacular and very eye-catching, bursting forth as the leaves are young and barely formed. The fruit appear in late autumn, and are much smaller than those of the cultivated quince. All the same, they contain a huge amount of pectin, and can therefore be chopped and added to preserves that refuse to set without the addition of lots of jam sugar. For this purpose alone, they deserve consideration as a forager’s way of preserving the very last of the season’s fruit over winter. An escape from the Berlin Botanical Gardens in Dahlem, few-flowered garlic is a fair example of how species can flourish to detrimental levels on being introduced to a new environment. 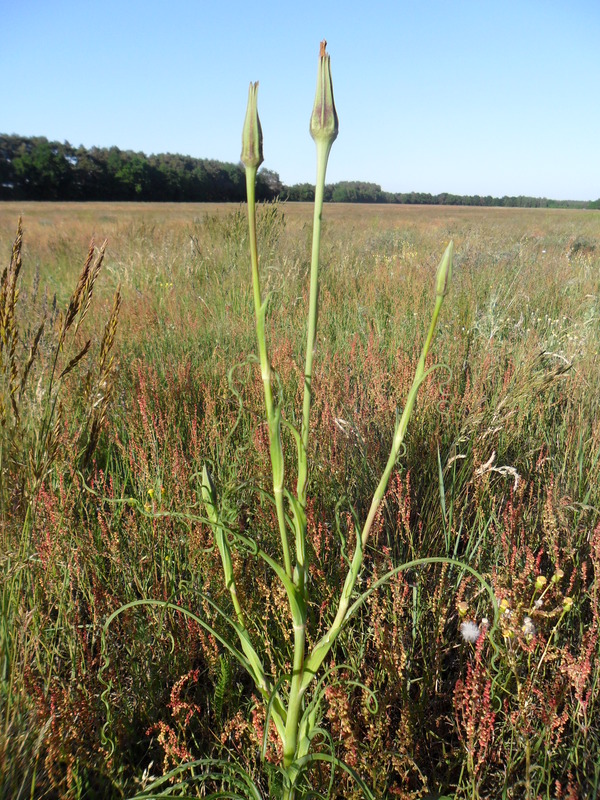 The short-lived but vast stands of flowering leeks have doubtless caused a drop in species diversity around the forests of Berlin since the time of its introduction from the Caucasus as a plant of geo-botanical interest. It can be found as early as late March, and is known commonly and erroneously as Bärlauch by Berliners. 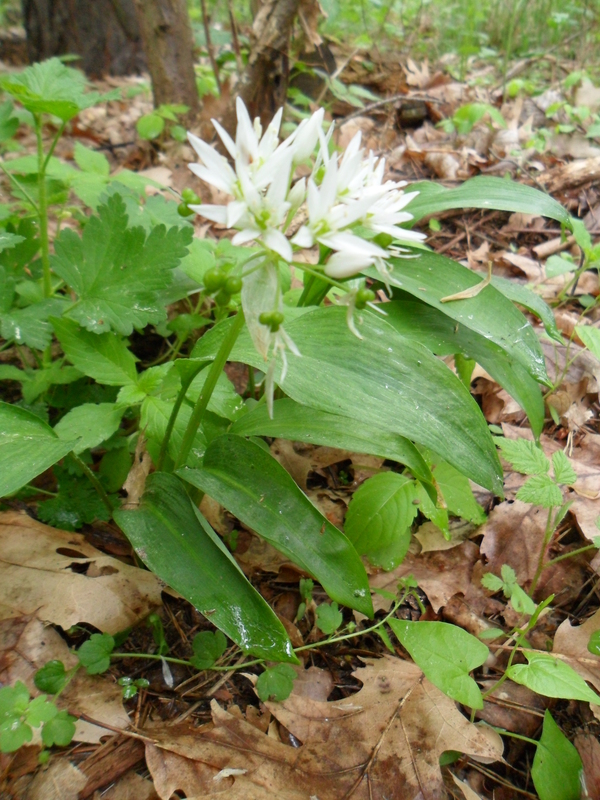 In bearing this name it is being mistaken for ramsons (A. ursinum), which flowers later but is found in similar mass sites in partial-shade woodland, and is our common English wild garlic. However, few-flowered garlic has strap-shaped and not spoon-shaped leaves, and rather curiously develops a cluster of bulbils within a membranous sheath in ‘flowering’. There is also a white flower tucked in this sheath, but as the bulbils are fully-formed before the membrane bursts open, it is likely redundant in the plant’s propagation. The bulbs themselves reach little more than a centimetre in diameter. The leaves are succulent, the bulbils and bulbs pungent, all tasting of a lightly garlicky spring onion. I am experimenting with a sort of wild leek Almas, a vegetarian fake of the white form of beluga caviar, as collecting any quantity of this you end up with hundreds of the miniscule crunchy bulbils in your basket. See the blog for more on this. 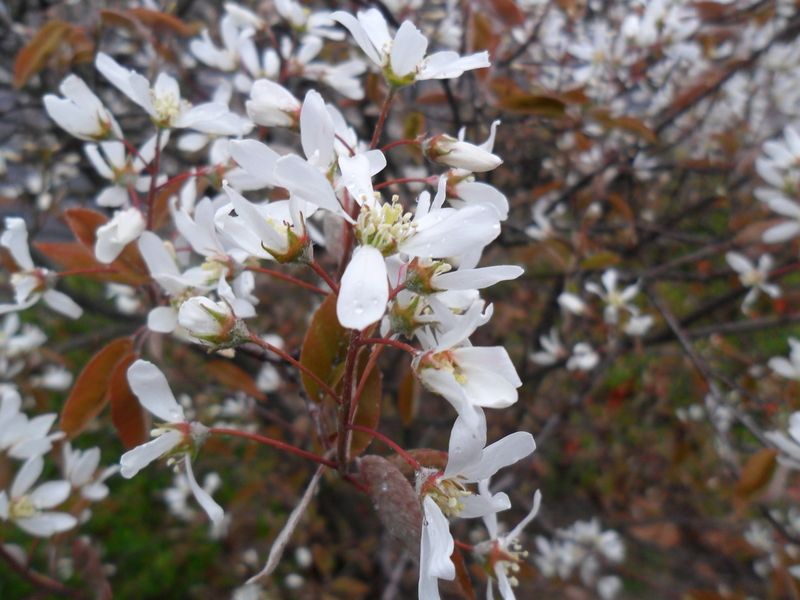 This is the small tree that started this blog, the serviceberry, most likely A. x lamarckii or snowy mespilus, that species being the common choice in urban landscaping. In spring it distinguishes itself from its superficial likeness to the rowan with these masses of delicately scented magnolia-like blossoms. In June, before the pigeons, blackbirds and other birds get there, the shrubs bear a purplish berry, very much similar in size and shape to a bilberry. They have a middling pectin quality, and a weak poison in the seed, much like barberries. Serviceberry trees also have brilliant autumn foliage, their leaves burnishing before the winter months. The tree suckers easily, and the stems of larger shrubs often grow out at an angle very easy to climb. A great activity in June therefore is fighting pigeons in the boughs with your basket in your teeth. At a family level it is related to both the medlar (Mespilus germanica) and the true wild service tree (Sorbus torminalis), hence the common names. It is however probably a hybrid of North American species, crossing very easily with other members of its genus. A lone sea buckthorn (Hippophae rhamnoides) growing at the base of a former gravel pit, St George’s Day. The main reason I didn’t add a photo for this plant is because the forage took place at night in the depths of winter. Even so, anyone actively looking for the plant from the end of autumn on will be sure to find it – the heavily-laden boughs of tightly-clustered berries are visible at great distances. Before fruiting, however, it is a different story entirely, being a somewhat inconspicuous and retiring plant to place when in dense growth. Knowledge of the family helps – sea buckthorn is an Eleagnaceae, the oleaster family, the oleaster itself being a regular garden shrub; sea buckthorn has a similar aspect to the more regular members of this family. 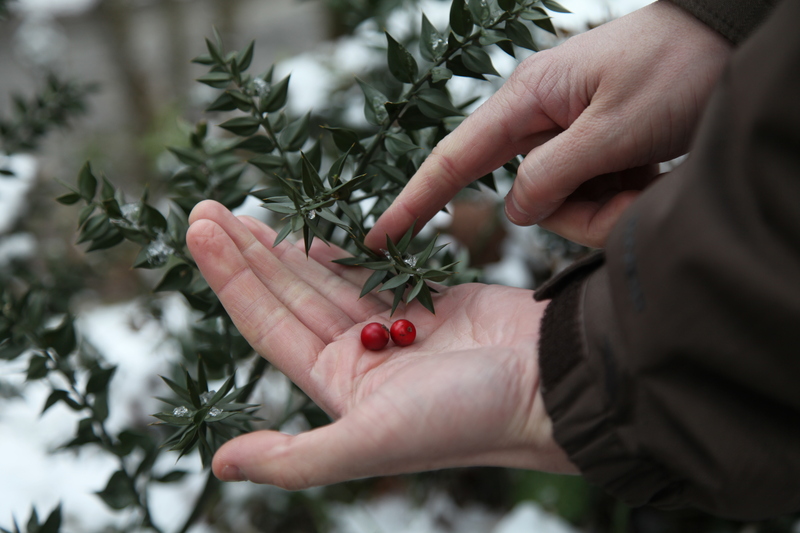 The rhamnoides part of the name means ‘buckthorn-like’, referring to the plants of the Rhamnus genus, another group of plants with which sea buckthorn has some general similarities . More immediate traits are the spines running along the boughs, which are tough but not viciously thorn-like. The silver-bluish, somewhat olive-like leaves are ochre-dusted on the undersides (see second photo), and fleshy, unfolding from similarly ochre-dusted leaf nodes, and this for me is the decisive point. With its somewhat checkered frequency, it is for some reason a pleasant plant to meet, sometimes hundreds of miles from the nearest coast. 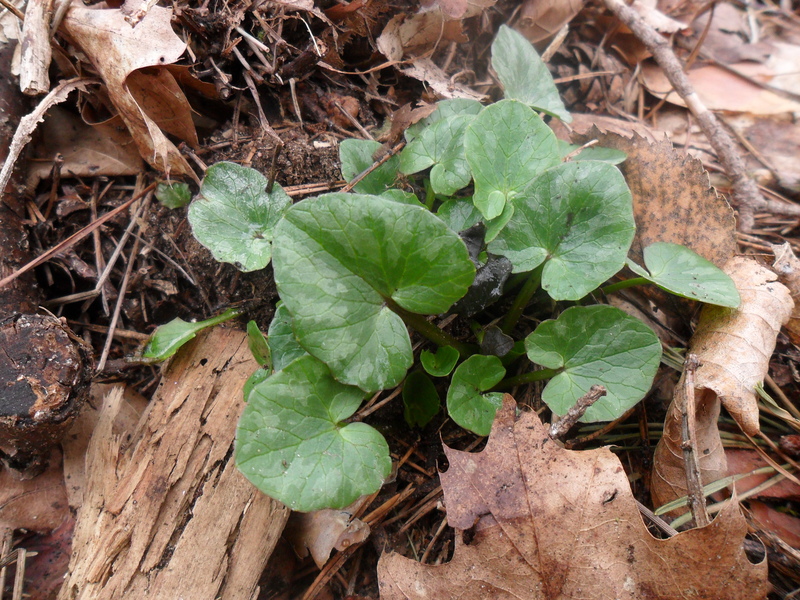 Ground-ivy, growing on the verge of a woodland path, late April. Though generally small in aspect, the plant can often be found in large drifts thanks to its stoloniferous growth. Often after spotting one specimen, hundreds seem to spring up from the ground. A dense mat of ground-ivy is often threaded with the sounds of the bumble-bee, which feeds on the nectar of the tiny flowers, whose structure mark it instantly as a member of the Lamiaceae or mint family. 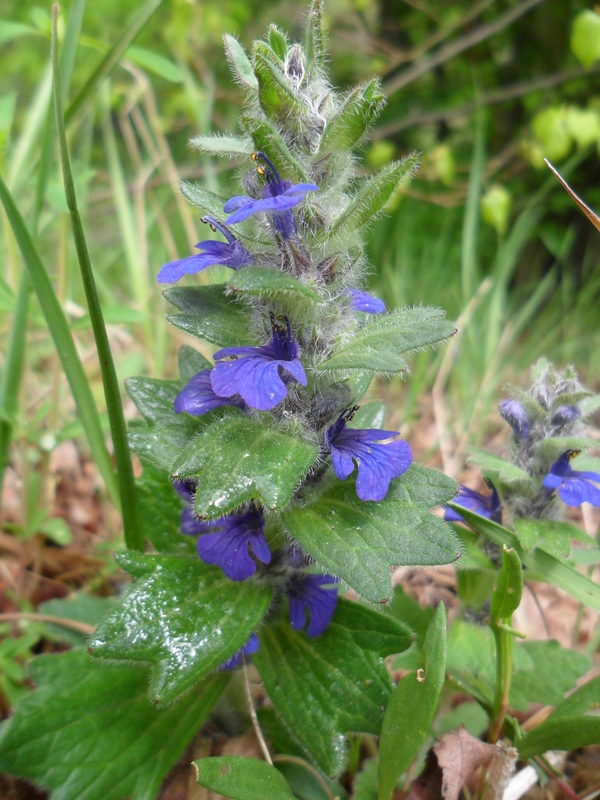 From a few paces it can often be mistaken for bugle (Ajuga reptans), but bugle’s flowers are regularly true blue, lacking a dorsal spur, and the leaves are regular, unlike the frilled leaf margins of ground-ivy. Traditionally, it served the Saxon cultures as a bitter flavouring for beer, but its taste is anything but simply bitter. Munching a plateful of the leaves and typing, there’s everything from mild juniper berryness, warm peppery tones, a non-menthol sort of mintyness, and several other indescribable notes: on being offered to try it, one guinea-pig described it to me as ‘like the tang of damp sheep’s wool, but in a good way’, another, like ‘having the Roman Catholic church in your mouth’. 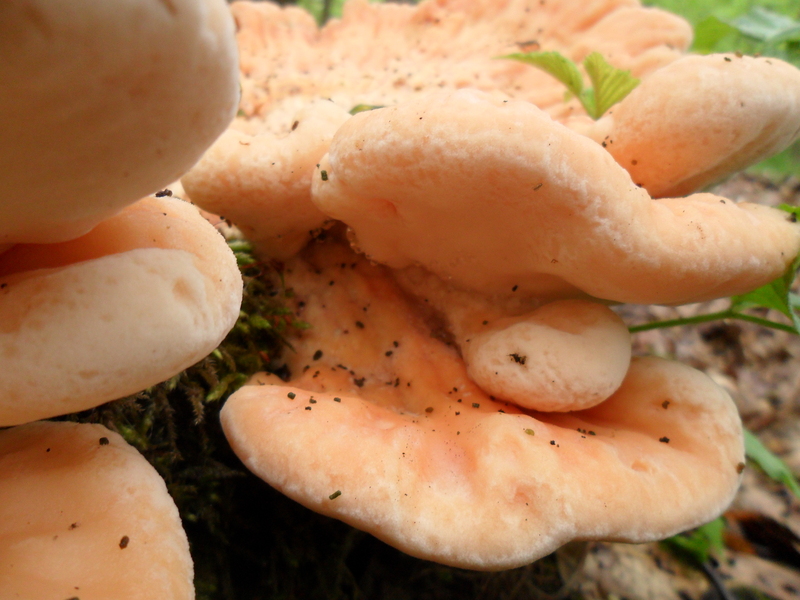 The fantastic bracket fungus known as chicken of the woods, in early May. Found often on old oak and other deciduous trees, it can sometimes be found in great quantities after the spring rains, the biggest ever haul being recorded at fourty-five kilo. A harbinger of a type of wood rot in trees, it is not uncommon to find the fungus parasitizing lofty branches, way out of the reach of the terrestrial forager. It grows in fans of spongy, pinkish-yellow protrusions, but there is great variation in its physical appearance, sometimes being merely bulbous and lacking the sculpted form of larger specimens. When cut, the flesh is delicately marbled, and has the distinctive apricot scent similar to that in chanterelles. It often drips a clear liquid. Taking care not to remove the ‘bracket’ of the fungus itself, a clean, rounded incision will ensure that the fungus lives on after the fruit body has been cut away. As its namesake implies, it has the texture of raw chicken breast, though on cooking, it inevitably loses some of its solidity. It is great in risottos and quickly seared with herbs for a mycological take on the chicken salad. 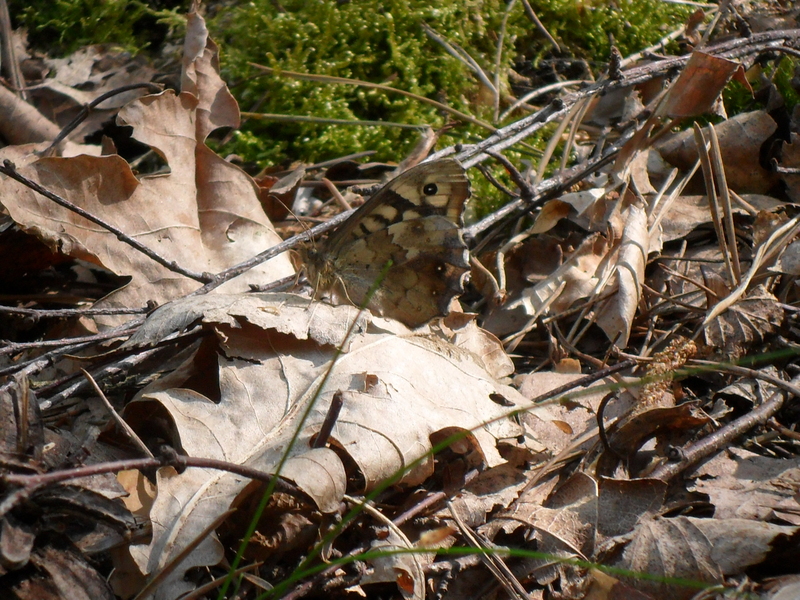 At rest, blending seamlessly with the forest floor, a grayling butterfly showing the undersides of its wings. It is traditionally found in the beginning of May, and on 30 April this one and several others were gaily rehearsing their official arrival into the woods of late spring. The deeply scalloped wing veins are the true identifiers, but it is much more conspicuous in its ability to almost completely vanish into the texture of the forest floor. It is said to favour pine pollen, hence its life cycle coinciding with the release of pine pollen in early May. After rain, bugle plants crouching under a mature pine, in deep shade. It is an attractive member of the mint family, with an almost non-existent ‘dorsal sepal’. Its alternating rows of blue flowers provide sustenance for a variety of insects. It is covered in a dense layer of tiny hairs or bristles, which help distinguish it from its close relatives. The freshly-mown-grass scent of sweet woodruff is another of the forest’s ways of announcing spring. Superficially resembling cleavers, it’s only when you come across a stand of flowering sweet woodruff that you realize how dissimilar these two related plants are in form. 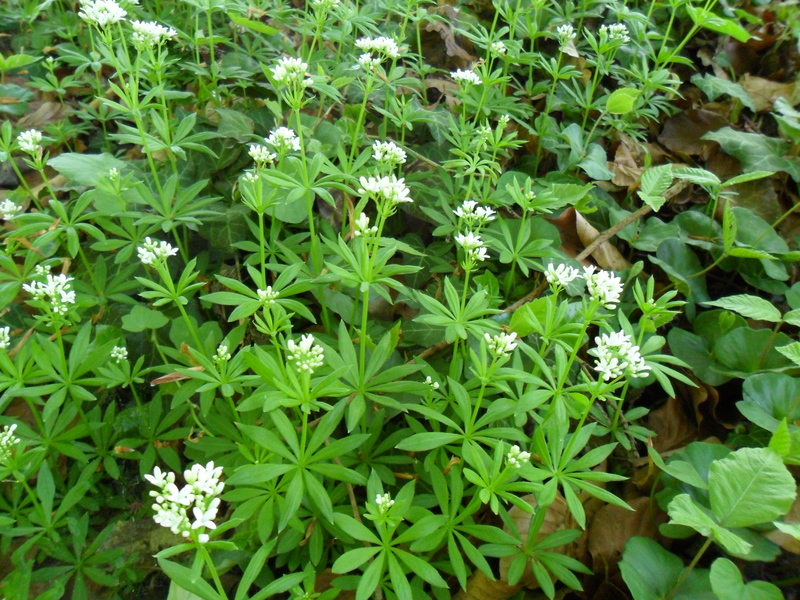 As a herb, sweet woodruff is generally quite neglected in the tradition of the British Isles. In Germany, where it is known as Waldmeister, the master-of-the-woods, it is infused in a traditional drink called Maibowle, to usher in the May. Care must be taken not to over-do the amount of fresh herb infused; as little as five grams per litre is the recommended amount, as there are small amounts of the liver and kidney damaging chemical compound coumarin present in all parts of the plant. These however are so low as to make a moderate yearly intake completely harmless. The Maibowle is in any case insipid, mainly consisting of cheap white wine mixed with cheap sparkling wine – nothing compared to the cool scent of a dense stand of sweet woodruff rolling through the woods. Unusually solitary, this is wild garlic growing in dense woodland in early May. This is the beloved ramsons so common in late spring in the British Isles. It grows often in shady spots on humus-rich soil, which helps on locating it in any quantity. Where I am, it is practically taken over by the rapacious growth of the few-flowered leek (A. paradoxum), but it commonly grows in vast stands winding through the woods. Breaking a leaf, there is an immediate scent somewhere between chives and spring onions, with the added sharpness of fresh garlic. 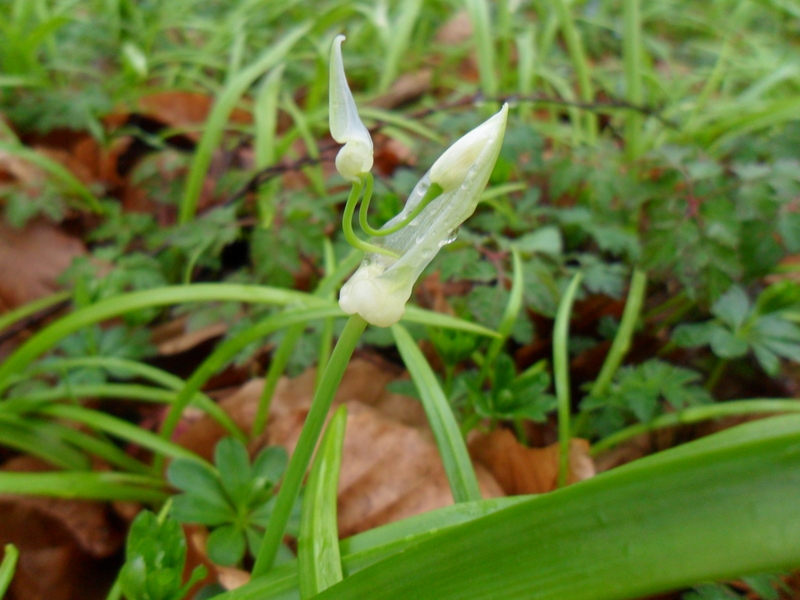 For those coming across ramsons for the first time, this is a good way of confirming its identification; there have been many reported cases of people confusing ramsons with lily-of-the-valley (Convallaria majalis) prior to flowering, though the latter has absolutely no onion/chive/garlic scent whatsoever. The flowers are white and star-shaped, and are similarly tasty, if a little ‘hot’ for some. The oils responsible for the garlic scent are used for lowering blood-pressure and for restoring appetite in traditional medicine. Decidedly red flowers of the common houndstongue, mid May. Often you can find a plant with puce-crimson flowers, damson-purple ones, and gentian blue ones all on the same plant, and for this reason it was sometimes named gypsyflower. The theory is that anthocyanins in the aging flowers bring about this colour change, communicating to pollinators (in this case, exclusively bees and moths) which flowers still contain nectar, and which are not worth visiting. The flowers of the viper’s bugloss (Echium vulgare), and sometimes also borage (Symphytum officinale) often behave in a similar way, and in evolutionary terms, it seems a highly efficient, ‘homing-device’ manner of increasing pollination. Houndstongue, viper’s bugloss and borage are also all hairy; for these reasons houndstongue marks itself quite clearly as a member of the Boraginaceae family. It grows on rich soil, in full sun, it is said, though I have found it in both sun and deep shade on numerous occasions. The species name officinale refers to its now outdated worth in the apothecary’s list of curative plants. Whether or not it is useful at all, it does contain small amounts of pyrrolizidine alkaloids, as do many of its family members. The smell of the flowers is hamster-cage-like, giving it the alternative name of ‘rats and mice’. The tongue reference probably refers to the shape and lolling nature of the leaves, and is a Greek-Latin rendering (kyno, dog, and glossos, tongue). 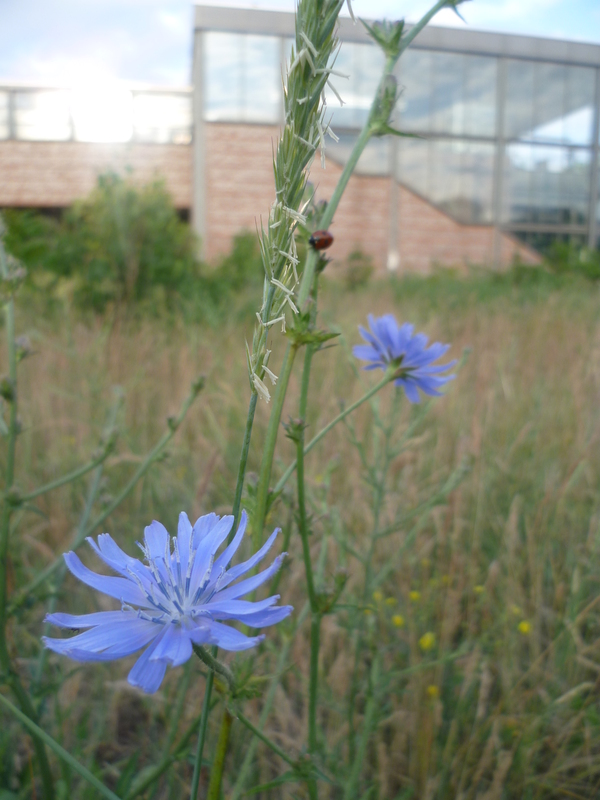 A common wayside plant, the vibrant blue flowers of wild chicory announce the approach of summer proper. With a rather obscure basal rosette, it is difficult to distinguish before its thick, severally-dividing flower stem is to be seen. However this stem is significantly woodier than those of the hawkweeds (Hieracium), the hawksbeards (Crepis) and common catsear (Hypochoeris radicata), or any other Asteraceae likely to give you trouble with the identification. All other chicories derive from this plant, which is quite hard to believe when comparing the wild form with cultivated radicchio and Belgian endive, which could not be more different in form. It is sometimes used in Mediterranean cuisine (leaves, buds) on account of its unusually delicate bitter flavour, as well as serving as a coffee substitute and adulterant (roots) since the eighteenth-century. That said, local populations of chicory can be quite thin, so research into its status and abundance before harvesting is worthwhile. 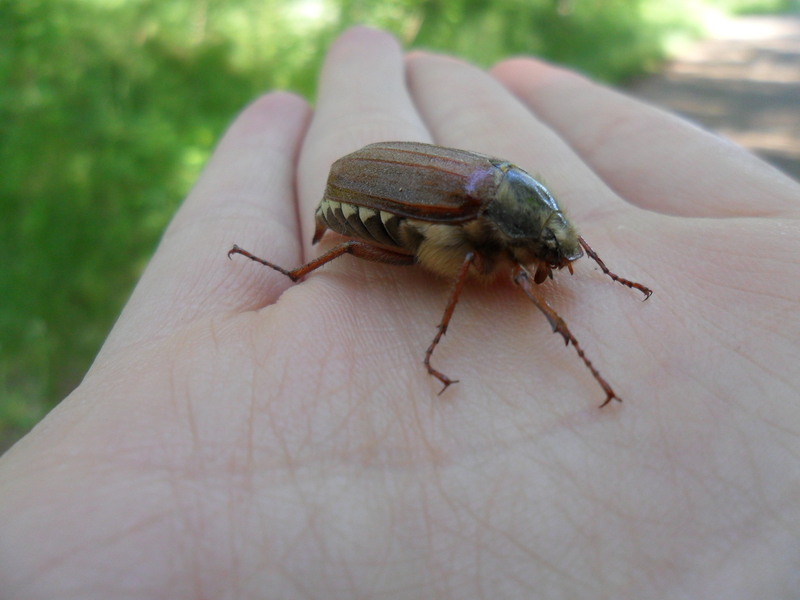 It is interesting and probably entirely coincidental that the figurative employment of beetles as beasts of burden is also reflected in the common name of Ocypus olens, the devil’s coach-horse beetle. 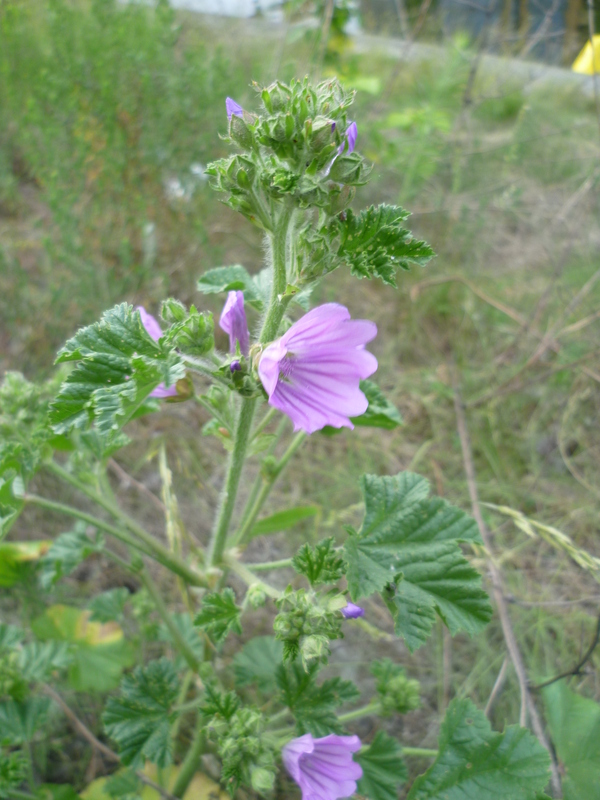 The much neglected common mallow, flowering by a roadside in early June. It is indicative of our fraying connections with plant folklore that the word ‘marshmallow’ no longer provokes any association with this ubiquitous herb; the ‘cheeses’ or fruits of the mallow, when boiled and properly prepared, release a highly glutinous liquid which can be beaten to the consistency of egg whites. This product is the original template for the sugary sweets we know as marshmallows nowadays. Nonetheless, experiments with marshmallow marshmallows give the most varied results – sometimes the mixture is frothy and buoyant, other times it collapses completely back to its liquid state. Wild food enthusiast John Kallas includes a chapter on the production of mallow whites in his book Edible Wild Plants, and the potential for the use of mallow whites in vegan cooking is self-explanatory from his research. All the same the recipe directions are somewhat unclear (‘pick mallow fruits at a rate of … cups per hour‘: ? ), and it seems the proper way of producing mallow whites is entirely forgotten. All the same, the flowers can be nibbled on or strewn over salads, and there are a number of recipes online for mallow crisps; flash-fried mallow leaves which supposedly emerge as puffed, green tortilla chip-like affairs. One common plant with more than a few uncommon usages. The unmistakable seed heads of the goat’s beard in early June, growing as usual on meadowland, this time among a sea of sorrels, grasses, and other wildflowers. Unfortunately for me, this was the first specimen I have managed to see this year, and I had missed its fantastic, multi-faceted star-shaped flower. It was late afternoon when I took the picture, and the goat’s beard has the unusual habit of only opening its flowers in the early morning, hence its alternative common name, Jack-go-to-bed-at-noon. That the plant was known by this nickname speaks archeobotanical volumes in itself; the curious flowering habit was not the interest of a few scattered botanical experts, but the business of a whole people sharing a common nomenclature. As a food source, goat’s beard is the ancestor of salsify and scorzonera, though it would take a very experienced forager to identify its grass-like leaves in the middle of a meadow before the flower-heads develop; upon this point, the roots become unpalatable and woody. Foraging for goat’s beard therefore has to be done either side of the flowering period, in early spring or autumn/winter, and would require a very rare sense of perception were it to be successful. Common foxgloves at the edge of a hay crop, England, mid June. Its thimble-like flowers are hungrily visited by bees during the summer months. The flower lip is often marked with curious brownish spots trimmed in white, very haphazard in pattern, which probably appeal to the pollinator’s colour spectrum. The plant is ‘poisonous’ in the regular sense, which should be a redundant proviso when taking into account its searing bitterness. Apart from providing food for the bees and being one of the true wildflowers given centre stage in the garden, it has been used in traditional medicines since medieval times, notably in folk medicine. The acclaimed Scottish doctor William Withering is said to have discovered its active ingredient by obtaining a ‘gypsy’ cure for heart irregularities. Due to fluctuating levels of the digitalis glycosides in the fresh plant it is synthesized as the drugs Digitoxin and Digoxin, being used to check the same cardiac problems. 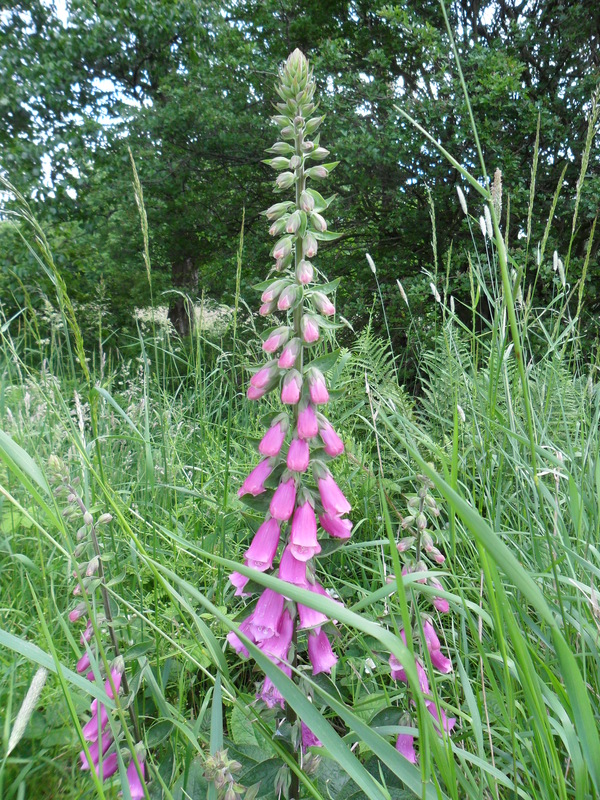 It is worth remembering however that, at a time when intimate knowledge of plant medicines was still alive, the dried leaves of foxglove were used safely and successfully. It is often the case that our lack of skill, knowledge and/or experience with a plant’s uses dictate exactly whether that plant’s usefulness is synthesized, actively prohibited, or simply forgotten. A very regular, two-inch tall specimen of the beloved chanterelle, known severally as Girolle (French), Pfifferlinge (German), and Pipernik jadalny (Polish). Undoubtedly one of the most delicious and prolific mushrooms of the mushrooming season. Its dun-yellow appearance makes it one of the easiest mushrooms to spot, and it appears most commonly on thin ground, not too heavily overgrown with tall grass and other vegetation. Needing no real introduction, it is the prolific ‘yellow gold’ making up the mainstay of any mushrooming expedition, which is of itself a ritual potentially tens of thousands of years old. The mushroom is essentially polymorphic, meaning that its physical variability defies any attempt to photograph a ‘classic’ chanterelle, though many ‘mycophiles’ approach this very paradox. Against a tree trunk it will grow buckled; in free earth it will grow cup- to palmate-shaped; in heavy undergrowth it will grow sometimes with an umbelliferous (umbrella-like) aspect. Though all mushroomers should be very aware of lookalikes, the false chanterelle (Hygrophoropsis aurantiaca) has been recently declassified as ‘responsible for mild stomach upsets’. The true chanterelle smells faintly of soft fruit (think apicots, nectarines), and has white flesh when cut. 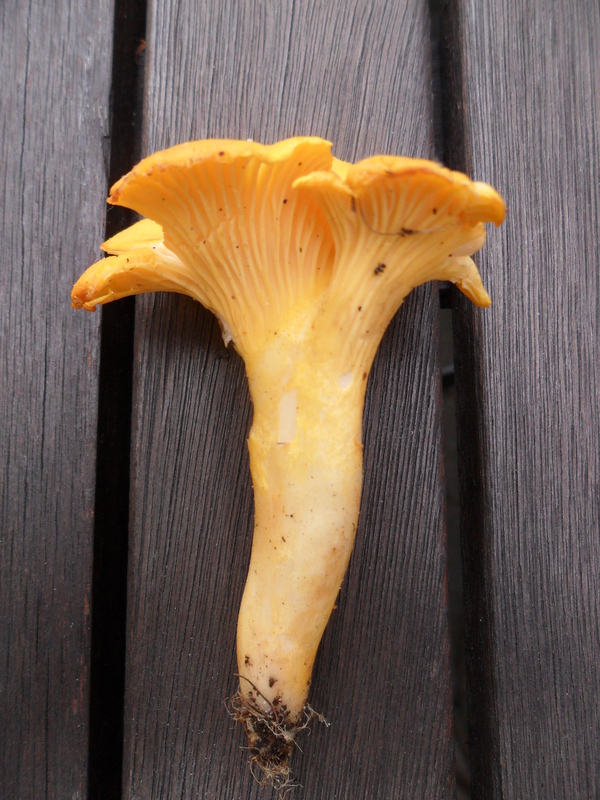 The false chanterelle has continuously yellow/orange flesh when cut, and its ‘gills’ often run completely down the stem, unlike the true chanterelle (see photo). Remove chanterelles at base level with a sharp knife and clean with an old paintbrush before cooking; do not eat any wild mushrooms raw. Cutting the stem at earth level ensures the further development of the fungus as an organism; the pictured chanterelle was lifted, mycelium and all, for educational purposes only, from a thriving chanterelle population on Eichkampstraße, Grunewald, Berlin. I take personally any changes in chanterelle populations in this area very seriously, and am sure that I have taken fair care not to damage the ecosystem through my efforts to introduce people to the world of fungi.